Get some quality steep ground days logged and give some of these tips a try on your way towards your ML assessment. 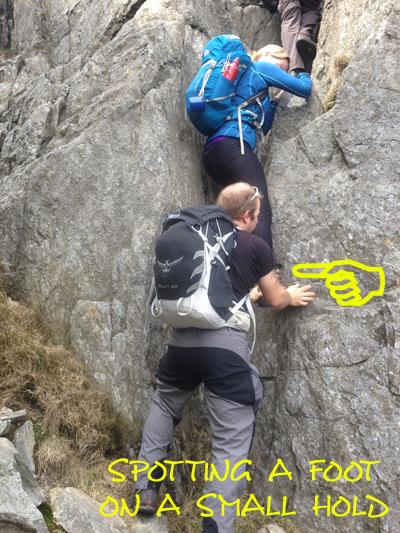 In this post I share some pointers for route finding, selection and planning and party management through steep and broken ground. I feel that there is sometimes a bit of confusion with the interpretation of ‘steep ground’ at ML level, when leading parties in the mountains. 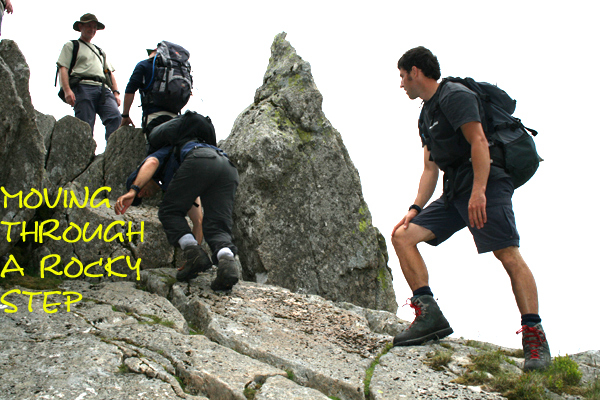 An ML mountain day is not rock climbing, and it needs to be emphasised that rope work (although an important part of a mountain leader’s tool kit) should only be used in an emergency, and not as part of the planned day. If you do find yourself having to resort to using a rope, it is usually due to misjudgement, or a mistake in navigation. One of the fundamental skills of a mountain leader is putting in a bit of planning and preparation homework prior to taking a group out on a mountain day. 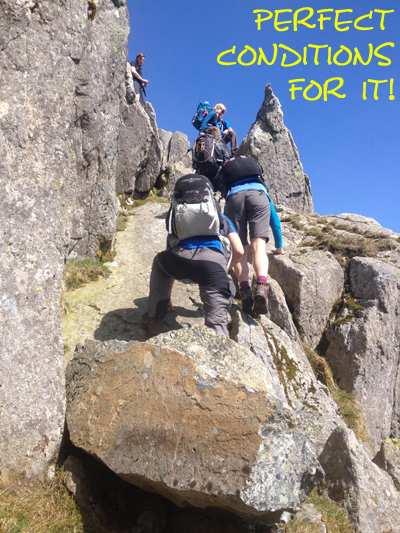 Also best done before you set out, route planning can save a lot of time on mountain days. Distance and time Have you allowed enough time for your proposed route? Terrain As well as gaining information from the map (1:25,000 scale shows good detail), familiarity with the area and local knowledge can give you a good idea of the aspects of terrain and ground conditions that maps don’t always show. Get the balance right Choose a safe route, but one that is also interesting and challenging for your particular group. Comfort zone Ensure that your route choice is well within your own personal comfort zone (if things do go wrong, you’ll need enough in reserve to step in and take charge of the situation). No matter how many books we read, or maps we look at, there is no better way to gain experience on steep ground than by getting out on it and getting a good feel for route selection first-hand. There are quite often paths to follow that negotiate their way around or through complex ground. Identifying a line of weakness through more complex ground as you are approaching it. This can save a lot of time and help to keep the day flowing; it can also prevent your group having to wait while you scope out the route. Breaking the route down into small sections, making group management much easier. 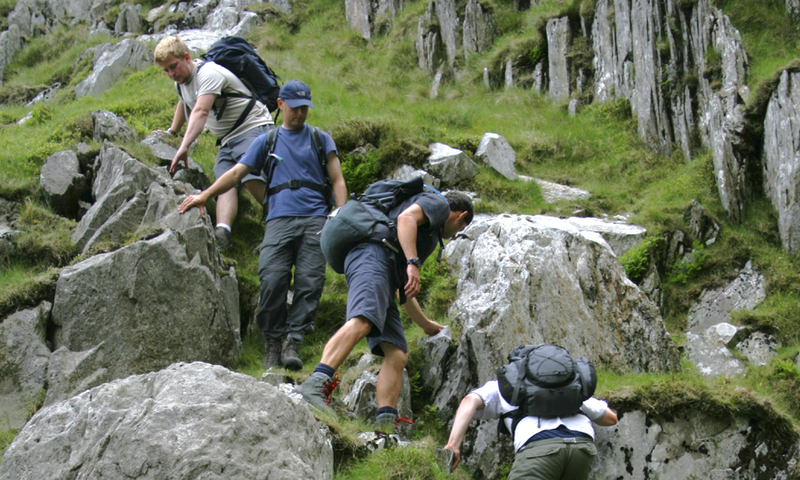 Moving through more difficult steep ground areas, for example rocky or broken ground, scree, wet rock and gullies. It is not always possible to avoid these, so practise can be invaluable. 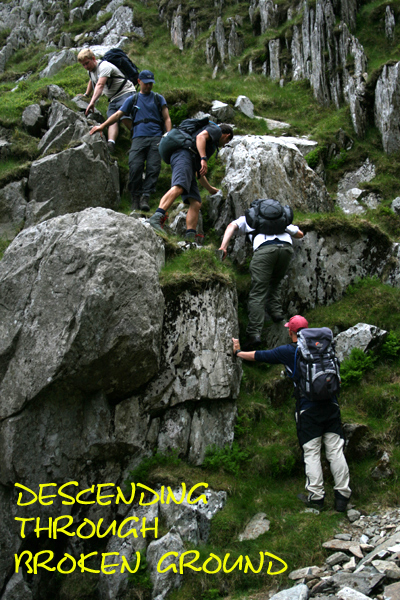 Practising descent through steep ground, as retreating through a short section may be your best option if a mistake is made on route finding. With rocky steps it is a good idea to assess and decide on your actions on your approach (again a good time saver), for example deciding whether you might need to put safeguards in place. Ask yourself ‘what would happen if…?’ (For example, if someone were to slip would they be likely to hurt themselves, or is it a straight forward step that requires no more than some simple advice). Personal safety Ensure you are not putting yourself in a hazardous position when spotting. Make sure that you have a good stance that allows you to ‘field’ the scrambler, without the risk of being knocked over a drop. Position If you find yourself holding on to the rock with one hand to feel secure, you are probably in the wrong place and will not able to spot effectively. Height Spotting is not very effective if the scrambler is over the spotter’s head height; a slip could result in a build-up of momentum that could be difficult to stop. Foot spotting As well as conventional spotting (the spotter’s hands placed to catch/support the scrambler), spotting a foot on a slippery hold can be very effective and give the scrambler a feeling of security. Over spotting Be aware of over spotting; you don’t want to patronise your group members. If you are uncertain of the ability of your group to negotiate a step, reassess your route and make a detour. This is probably going to be less time consuming than a series of over complicated spotting. Feedback and questions always welcome!